The word cargo refers in particular to goods or produce being conveyed – generally for commercial gain – by ship, boat, or aircraft, although the term is now often extended to cover all types of freight, including that carried by train, van, truck, or intermodal container. 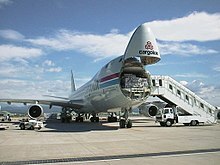 The term cargo is also used in case of goods in the cold-chain, because the perishable inventory is always in transit towards a final end-use, even when it is held in cold storage or other similar climate-controlled facility.Multi-modal container units, designed as reusable carriers to facilitate unit load handling of the goods contained, are also referred to as cargo, specially by shipping lines and logistics operators. Similarly, aircraft ULD boxes are also documented as cargo, with associated packing list of the items contained within. When empty containers are shipped each unit is documented as a cargo and when goods are stored within, the contents are termed as containerised cargo. Break bulk cargo is typically material stacked on pallets and lifted into and out of the hold of a vessel by cranes on the dock or aboard the ship itself. The volume of break bulk cargo has declined dramatically worldwide ascontainerization has grown. One way to secure break bulk and freight in intermodal containers is by using Dunnage Bags. Containers are the largest and fastest growing cargo category at most ports worldwide. Containerized cargo includes everything from auto parts, machinery and manufacturing components to shoes and toys to frozen meatand seafood. Trains are capable of transporting a large number of containers that come from shipping ports. Trains are also used for the transportation of cement, grain, steel, wood and coal. They are used because they can carry a large amount and generally have a direct route to the destination. Under the right circumstances, freight transport by rail is more economic and energy efficient than by road, especially when carried in bulk or over long distances. Boeing 777 freighter of Emiratesarrives at London Heathrow Airport(2015). By the Federal Bridge Gross Weight Formula the total weight of a loaded truck (tractor and trailer, 5-axle rig) cannot exceed 36,000 kg (79,366 lb) in the United States. In ordinary circumstances, long-haul equipment will weigh about 15,000 kg (33,069 lb), leaving about 20,000 kg (44,092 lb) of freight capacity. Similarly a load is limited to the space available in the trailer, normally 48 ft (14.63 m) or 53 ft (16.15 m) long, 2.6 m (102.4 in) wide, 2.7 m (8 ft 10.3 in) high and 13 ft 6 in or 4.11 m high over all. The United States has been one of the leaders in securing cargo. They see cargo as a concern to national security. After the terrorist attacks of September 11th, the security of this magnitude of cargo has become highlighted on the over 6 million cargo containers enter the United States ports each year. The latest US Government response to this threat is the CSI: Container Security Initiative. CSI is a program intended to help increase security for containerised cargo shipped to the United States from around the world.Europe is also focusing on this issue, with a number of EU-funded projects underway.